Revered in some quarters, reviled in others, Vampire Weekend have generated plenty of interest since their emergence from the packed Brooklyn scene circa 2007. But with two critically acclaimed albums under their belts, 'Modern Vampires Of The City' is accompanied by a certain amount of pressure. The band has responded in a curiously engaging fashion, offering a mellower sound, with a surprisingly overt religious theme. 'Modern Vampires Of The City' largely lacks the immediacy and euphoria previously seen on hits like 'A-Punk' and 'Cousins' - indeed, the album begins rather sedately, with 'Obvious Bicycle', which sounds like a modern re-imagining of The Beatles. The track signals the classical piano-heavy aspect of the album, with 'Step' even seeming to appropriate the ubiquitous 'Pachelbel's Canon'. The religious theme is choreographed in the title of 'Unbelievers', but is perhaps most prominently seen in the Torah-inspired 'Ya-Hey'. Not that Vampire Weekend are content to restrict the discussion to any one religion, with a reference to the Angkor Wat temple in 'Step', which has links to both Buddhism and Hinduism. While the lyrical intentions remain up for interpretation, tackling such a subject is undoubtedly a brave move. The band thankfully do not entirely escape their past, with tracks like the chaotic 'Diane Young' - an unusually bouncy number, relative to much of the early section of the album. 'Modern Vampires Of The City' sparks into life considerably in its final third, offering an energy more often associated with Vampire Weekend. The hyperactive 'Finger Back' providing a considerable contrast to the casual, laidback beginning of the album, for example. 'Modern Vampires Of The City' does stray into pastiche at times, with 'Worship You' coming across a bit too much like an off-cut from a Weird Al record, and 'Hudson' proving conspicuous in its excess melodrama. The vocal pitch also finds itself unnecessarily distorted from time to time, detracting from the wonderfully soothing vocals - 'Young Lion' being a prime example, and a suitably beautiful closing track. The afro-pop may be long gone but the glorious melodies remain. This record truly highlights a new Vampire Weekend - fearless and ambitious. 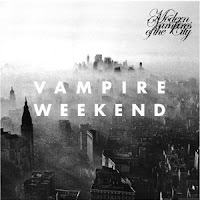 It arguably doesn't always succeed as a coherent mission statement but it's likely that 'Modern Vampires Of The City' will go on to become the defining record that Vampire Weekend create. Mazel tov, chaps, mazel tov. Find more info at vampireweekend.com. 'Modern Vampires Of The City' is available to purchase at amazon.co.uk.